Dennis Bergkamp bowed out of football on a entertaining, celebratory opening day at Arsenal's new Emirates Stadium. A sell-out crowd revelled in seeing some of the club's greats play in a second-half Legends match against Bergkamp's first club, Dutch side Ajax. Ian Wright, Emmanuel Petit, Patrick Vieira and Marc Overmars were some of the names to return for the Gunners. And 59-year-old Johan Cruyff and Holland manager Marco van Basten came on for Ajax in the last 10 minutes. Ajax's Dutch international striker Klass-Jan Huntelaar had the honour of scoring the first goal at the 60,000 capacity stadium in a first half in which the clubs sent out a host of youngsters for a regulation pre-season run-out. Huntelaar went close on a couple of occasions before turning in Edgar Manucharyan's low, flat cross from the left. After the break the girths were a little wider and the legs, in some cases, a bit slower than in their heyday as a new match began between two teams of legends. But it was Arsenal's only present day player on show who gave the hosts the lead. Thierry Henry, having chartered a private jet to fly back from a family holiday in the USA for the match, converted Lee Dixon's cross to the delight of the home fans. And after Ronald De Boer blazed a penalty over following Gilles Grimandi's foul on Tottenham's Edgar Davids - the day's pantomime villain, Kanu's deflected shot made it two to Arsenal. He may not have scored, despite being put through one-on-one on the right in the closing minutes, but the day was all about one man and Bergkamp was given a rousing send off. "If I was to have a testimonial it was always going to be against Ajax and their fans have put in a lot of effort to come here," he said in an emotional speech after the final whistle when he gave thanks to one and all. "My mum and dad were always there from the beginning and have probably seen every game. "And my wife has been amazing over the years. You can't do a career like this alone and if it wasn't for her I would not be here. "It's difficult to say goodbye. I've had a fantastic time over the last 11 years and a big part were the fans and how they treated me - they have been fantastic." 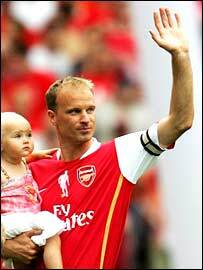 Bergkamp was carried shoulder high during a lap of honour by Vieira and Henry - Arsenal captains past and present. It was applauded long and loud by the legends on the pitch as well as the crowd who have marvelled at his Arsenal displays for the last 11 years during which he has scored 120 goals in 423 games.